What Is DA Form 2339? DA Form 2339, Application for Voluntary Retirement is a form used to start the necessary administrative action on voluntary requests of retirement. The retirement procedure includes a medical examination of the applicant and a review of the application, that should be submitted at least nine months before the desired retirement date. 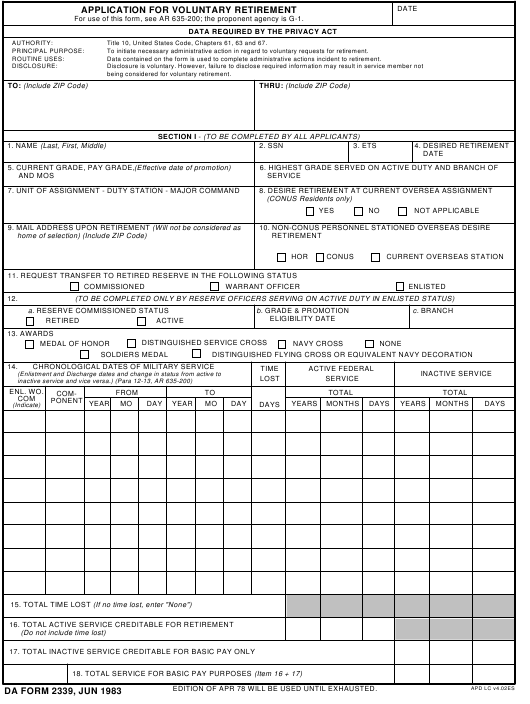 The latest version of the form - sometimes confused with the DD Form 2339, International Military Student Information - was released by the Department of the Army (DA) in June 1983. An up-to-date DA Form 2339 fillable version is available for digital filing and download below or can be found through the Army Publishing Directorate website. How To Fill Out Da Form 2339? For use of this form, see AR 635-200; the proponent agency is G-1. Title 10, United States Code, Chapters 61, 63 and 67. To initiate necessary administrative action in regard to voluntary requests for retirement. Data contained on the form is used to complete administrative actions incident to retirement. being considered for voluntary retirement. EDITION OF APR 78 WILL BE USED UNTIL EXHAUSTED. TRAVEL AND TRANSPORTATION ALLOWANCES, BASED ON MY RETIREMENT AT A CONUS LOCATION OF CHOICE. I DO NOT ELECT TO BE PROCESSED FOR RETIREMENT AT A CONUS LOCATION OF CHOICE. accepted by the retirement approval authority. IS NOT SUBMITTING REQUEST IN LIEU OF ELIMINATION OR FURTHER ELIMINATION PROCEEDINGS. HAS NOT INCURRED A SERVICE OBLIGATION (If "HAS"
that my retirement will take effect on the requested date and that I will not be held on active duty to complete this examination. cost of coverage for my wife, and children if applicable, unless I submit an election form to the contrary prior to my retirement. The first section of the form is completed by the applicant with the assistance of the officer having custody on the applicants' personnel records. Blocks 1 to 11 are mandatory. First, the applicant has to provide their full name, SSN, ETS, and desired retirement date. Then the form requires their current grade, pay grade and MOS and their highest grade on the AD with their branch of service. The applicant has to provide their unit of assignment, duty station, and major command. CONUS residents should fill Block 8 if they desire retirement at their current overseas assignment. Non-CONUS residents should fill Block 10 if they desire oversea retirement. The form also requires the applicants mailing address upon retirement and their transfer request status. Blocks 12 to 19 are completed only by Reserve officers serving on the AD in Enlisted status. They should state their reserve commission status, grade and promotion eligibility date and branch of service. All awards received should be listed in Block 13. Block 14 is designed as a table with four main columns: the chronological dates of military service, time lost in days, active federal service and inactive service. Blocks 15 through 18 are for submitting total active service or inactive service to state the eligibility for retirement, basic pay or basic pay purposes. Block 19 is for stating readiness to retire at a CONUS location of choice. Section II consists of 11 blocks and is filed by the applicants' personnel officer. They must approve or disapprove the application, verify whether the applicant decided to proceed with a request or elimination, state the dates of arrival at the current assignment or overseas command, the receipt of the alert and the notification of unit alert. The applicant has to read all conditions listed in Block 30 and sign the form. Any additional information should be listed in Block 31. If the provided space is not enough a continuation sheet may be added to the form. The commander should provide their full name and signature for the DA 2339 to be complete.